Recently, our dentist had told my wife that alcohol based mouth washes were being studied for causing mouth cancer and also could lead to dry mouth. He also mentioned that more and more manufacturers were moving away from alcohol based products (for obvious drinking related reasons included) and towards a non-alcohol related formulation. We did a little bit of research and found Wal-Mart had the best price after consulting Shoppers Drug Mart, Your Independent Grocer and Loblaws. On the evening of Friday May 8th my wife and I were grocery shopping at our local Wal-Mart Canada. 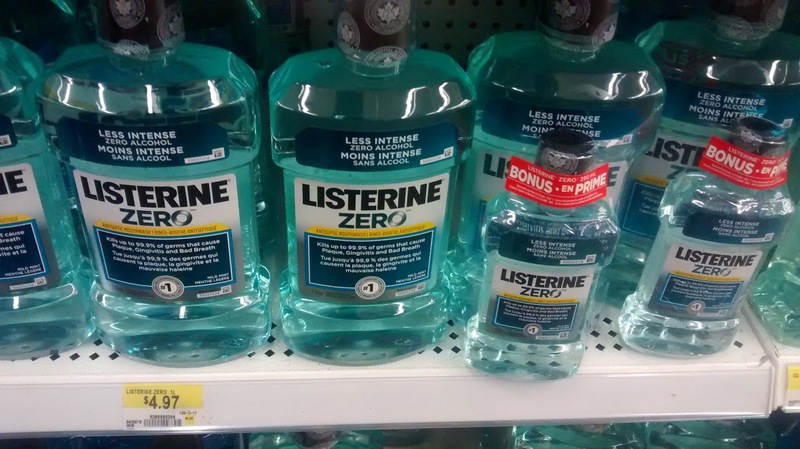 We came across a bonus offer by Johnson & Johnson's Listerine brand. Regularly priced at $4.97 for 1L bottle, there appeared to also be limited supply of a Bonus 250 mL travel sized bottle attached at no extra charge. We of course reviewed the shelf pricing, $4.97 and there didn't seem to be any indication that the bonus package would cost anymore. 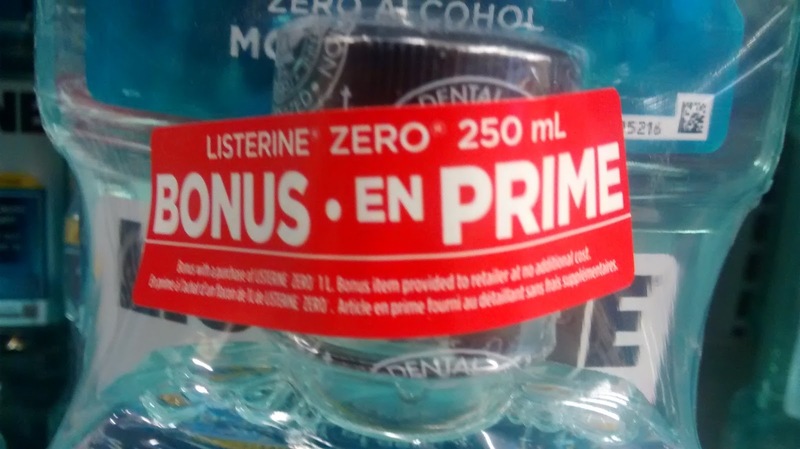 In fact Listerine had added a red "Bonus" sticker indicating the "Bonus item provided to retailer at no additional cost". Great! So Wal-Mart received the bonus and passed onto the consumer the freebie that Johnson & Johnson so graciously offered right? WRONG! After finishing our shopping, checking out, we reviewed our receipt. Why was the Listerine listed at $5.79 before taxes? We reviewed the shelf tag and took a couple of photos to help the Customer Service Associates. This Wal-Mart is notorious for paging for assistance for price checks. It usually better to take a photo of the item in question with the price tag visible. Otherwise you are stuck at the front counter until either sales associate is paged three times and responds or a manager takes pity and you hike for miles to show them the price tag and return to the counter. We headed over to the Wal-Mart Customer Service counter to inquire with the Customer Service Associate there about the price discrepancy. She went over to a couple of managers who were speaking in the aisle before cash registers to inquire. Tina, one of the store's Assistant Managers came over and reviewed the item and the photos I took. As well we reviewed the weekly add where, on the back page, the Listerine was advertised at $4.97. Tina decided that the best she could do is offer the bonus pack at $4.97. I asked her why Competition Bureau of Canada's Scanning Code of Practice would not apply. A little thought on her part and the reply was "because it's a different UPC and the original one is on Roll back". I asked to speak the manager as this product was not obviously on "Roll Back" as it was the same price the previous Friday before the current flyer (which started May 7th) had even started! Tina said, Cory Allan, wasn't in that night and the best she could do was honour the original $4.97 price. She then left. I asked if that phone number (1-800-328-0402) , posted next to a smiling photo of the Store Manager Cory Allan and his promise that if there was an issue a member of Cory's Management team would "make it right", was for Wal-Mart Canada Customer Service. "Yes it is", was the reply. "I'll start dialing then" came the reply. Of course I wasn't moving. This instance was a blatently obvious Scanning Code of Practice violation where the product was scanning in at a higher price than the shelf price. I waited for the automated system and dialed the appropriate number as prompted while athe associate looked at me cross eyed. The associate typed a few things into the computer and put cash and receipt on the counter like this was the end of it. "Could you please leave the area?" came the question from the Associate. "No, I'm currently escalating my complaint to the next level with Wal-mart Head Office Customer Service, and they may want to speak to you". The associate called another Assistant Manager, Michael, over and claimed I raised my voice to her. It was quite obvious that this Wal-Mart wanted to avoid at all costs a claim under the Scanning Code of Practice at any cost as to avoid being caught on their store statistics. It was quite obvious that they had been nailed on store statistics as there were postings for how many Wal-Mart Mastercards Cashiers had successfully signed up and the Scan Rate the store was aiming for and had failed to meet at least for that week posted on white boards. Finally getting through on the phone, I asked the call taker to hold while I explained to Michael the issue. Michael said there was nothing he could do as Tina was the "Duty Manager" that evening and Wal-Mart Policy was the Duty Manager had the final say unless I spoke to the Store Manager. I replied to the Associate I'd like a full refund for the purchase as the store obviously didn't want to adhere to the Scanning Code of Practice they had posted notices about, as required by law, at each cash. The Customer Service Associate grumbled and put more cash on the counter with yet another receipt. This despite me with my credit card out waiting for her to do the refund. I asked if it was not Wal-Mart policy to refund on the original method of payment and pointed to the the original receipt showing the credit card payment. She sighed and left, with the cash unbelievably still on the counter, to find her own manager. The Customer Service Manager, Sherry, came up, inserted her key and refunded the amount onto my credit card. I thanked her and she sighed and left. I'm not sure where Sherry was in the first place and why Tina was required, but whatever. Back to the phone where, amongst the above, I was now onto the 3rd Wal-Mart Customer Service Representative who, supposedly, could help me. I relayed my story to him and he promised that the Wal-Mart Trainyards Store Manager would call me back. I asked how long, he said normally 24 hours. I asked, if this being Friday evening, if by end of day Monday I had not heard anything back from Wal-Mart period if I should call and check in. The Wal-Mart Customer Representative agreed and I hung up. The weekend and Monday came and went with not a peep from either Store Manager Cory Allan or Wal-Mart Head Office's Customer Service team. So I took to Twitter on Tusday May 12th and asked Wal-Mart Canada repeatedly for help in the hopes their social media team would take up the issue and reach out. Sadly, they gave me the same 1-800 number to reach out to. @MichaelSuddard Hi Michael. Please call us at 1-800-328-0402 and a member or our team will be happy to help. I followed up with a couple tweets asking if a "Customer Service Manager" would be available and received no reply from the Wal-Mart Canada Twitter team. So I called back on Thursday May 14th to check in with Wal-Mart Head Office Customer Service. The first rep actually picked up the phone within 30 seconds and knew what he was talking about! Hallelujah! I explained the situation to him and he asked me for an "issue tracking number". A what? The previous call taker never provided a tracking number for the issue. But at least this Customer Service Representative new what he was talking about. He looked up the phone number I had provided and easily found my issue and gave me the issue tracking. He reviewed the file and said his option at this point was to resend the e-mail to the Wal-Mart Store Manager, Cory Allan for follow up. I followed up to ask if the District or Territory Manager would be CCd on the e-mail as the issue was obviously ignored by Cory Allan. Yes the District Manager is came the positive reply. Now I tried my luck saying that yes the Customer Service Agent had been positive but the issue had obviously been dragging on long enough (almost a week and counting) and if a Wal-Mart Customer Service Manager was available? No they are not, they are on other calls. "Could they give me a call back? ", I inquired. "Sure! ", came the reply and I gave him my number and we moved on from there believing I would call within the next 15 minutes. I was promised Fadi or someone else with an indecipherable name would give me a call. 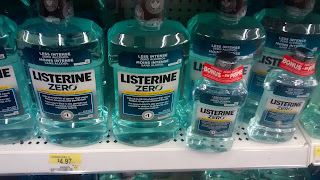 An hour after the phone call and nothing from Wal-Mart Customer Service, I decided to try investigating if the manufacturer of Listerine had anything to say. After some Googling around I found that Johnson & Johnson was the manufacturer. I also found their "Contact Us" page and the ability to send an e-mail to them for follow up via their website. By 11 P.M. that evening I had a reply from "Becky" from Johnson & Johnson apologizing for the situation and asking for contact information as well as the Lot number of the bottle in question. I reviewed the bottle at Wal-Mart and took a photo as there were two lot numbers! I followed up with Becky via e-mail with address and lot number question. Following the long weekend I received an e-mail from Kyle at Johnson & Johnson who thanked me for the photos of the Lot numbers and promised coupons would be mailed out shortly and I should receive them within the next 7-10 days. Johnson & Johnson came through with flying colours in Customer Service by being both courteous in responding to valid customer issues and having quick turnaround times when contacted. In less than 24 hours I had responses to my two e-mails by Customer Service agents who knew their stuff and could do something like it. I followed up again on Twitter with Wal-Mart after the May 14th phone with Wal-Mart Canada in hopes someone somewhere would acknowledge the issue and address it at store level. @MichaelSuddard Hi Michael. Please DM us your phone number and a member of our team will be in touch. I followed up on the Friday with my phone number with hopes Wal-Mart would admit there error and apologize for the customer service calamity. To say the least, I followed up Twitter with them on Tuesday May 19th with no response. Since then, I've filed a complaint under the Government of Canada's Competition Bureau's "Scanning Code of Practice" using their website. I expect in the coming weeks to be contacted by this federal government agency to provide photos and my side of the story. I do hope the Wal-Mart Customer Service will provide better service to the federal government investigators than what I received. Today, I received a phone call from Amy of "Customer Experience" from Wal-Mart in Mississauga. Coincidentally, Wal-Mart's Canadian Head Office is in Mississauga. But, like the rest of this Wal-Mart extravaganza, her phone number was listed on my call display as "Blocked number". I didn't pick up the call as usually these numbers are nothing more than overseas telemarketers locked away in a meat locker trying to hornswoggle me into purchasing windows or duct cleaning. A short while later a message. Amy left her name and phone number to call back with a message she was following up about my Twitter inquiry about Customer Service. Great! 3 business days later Wal-Mart was actually following up! I called back the phone number provided, pressed 1 for English and then provided the option to enter in a five digit extension, use the company directory or wait on the line. I chose the latter as all I had was the name "Amy" and the phone number I just dialed and to ask for "Amy at Customer Experience". So waited on the line for 10 minutes listening to how there was "higher than normal call volumes". I hung up after not speaking to anyone. I tried again 2 minutes later figuring my phone call had fallen through Wal-Mart's awesome Customer Service phone system. Another 10 minute wait and nothing. I tried the Wal-Mart 1-800 Customer Service number again wondering if they would be better at getting ahold of Amy. The rep picked up in 15 seconds of me entering the que. I asked for "Amy of Customer Experience". He had no idea who that was! I asked to speak to a Customer Service Manager, but of course none were available as they do not take calls. Finally an admission, if you call Wal-Mart Customer Service at 1-800-328-0402, you can not speak to a "Customer Service Manager" or any supervisor. All you get is every excuse in the book including "their in a meeting", "they are on another line" or the real admission "they don't take calls". So truth be told the 1-800 agents are merely message takers for Store Managers while also being a front that a customer's issue is really being escalated to a head office sounding locale when in actuality it is not. Obviously this entire number is really only provided to frustrate the customers. So I pressed on to call the 905 number again to see what would happen. In two minutes I had someone pick up the phone! I asked for "Amy of Customer Experience" and was put through. Amy picked up and I explained who I was and the situation as well as how hard it is to get through to her since she doesn't leave a five digit extension number or call from an unblocked number. Amy, to her credit, agreed that store had not adhered to the Competition Bureau's Scanning Code of Practice. She said she would contact the Store Manager and get back to me within an hour. 15 minutes later Amy called back (also from a "blocked number") and said I could go and pick up my product at Customer Service at the Wal-Mart Trainyards store. I asked two questions: Do I need ID and how long would the store require? All I needed was my name and phone number provided and I could go starting within the next two minutes. Great! Things finally seemed to be moving in my favour. That is until I got to the store in 45 minutes from Amy's phone call and waited in line at Customer Service. Once I got to the front and explained it to the Customer Service Representative I got a puzzled look in return. I gave her my name and phone number on a cash register receipt paper she provided. She then tried calling Amy within the store. That is until I corrected her and explained Amy was the "Customer Experience" representative and gave her the phone number for Amy. The Customer Service Representative tried to get a hold of the Wal-Mart Trainyards Store Manager, Cory Allan, but of course he wasn't reachable. She called a Customer Service Manager over and together we explained the issue. He disappeared for five minutes as I waited at Customer Service. He returned empty handed asking if I would join him in the aisle as he couldn't find any bonus packs. He offered me to make the whole situation right by receiving a 1 L Listerine Zero bottle plus a 250 mL bottle. He also asked what happened. I explained it to him and he nodded his head and couldn't believe it. He also reviewed the pictures of the shelf I took. He said that this was a clear case that the Scanning Code of Practice should apply. He offered me a second bottle of 250 mL Listerine and helped me check out at the vacant cosmetics counter. He apologized again and I left the store. Overall, Wal-Mart Customer Service from the Store Manager to their 1-800 number needs a complete overhaul. The Store Manager obviously refused to acknowledge the situation and the customer service reps at the 1-800 number refused to escalate the situation and only were interested in obfuscating the situation until the customer gives up in frustration. If Wal-Mart Canada actually cared about Customer Service to the level Wal-Mart Founder Sam Walton did, the Store Manager would have been returned the phone call and Wal-Mart Head Office's Customer Service number would have had a Customer Service Manager available. In the end, as I was leaving the store I was happy that Wal-Mart Trainyards was having a "Store Visit". Apparently, according to the store staff, management was arriving to review the store's operations. I do sincerely hope the Government of Canada's Competition Bureau Scanning Code of Practice was going to be reviewed and reintroduced to store staff as it seems obvious in my case that store management doesn't seem to understand it.